I just got back from lunch and all I can say is WOW. So so tasty... After this review, I'm probably going to lose all my credibility as a hater of coconut. 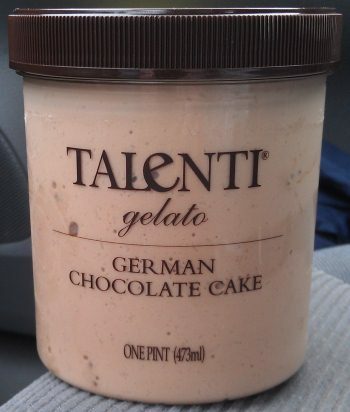 This is Talenti's (fairly new) German Chocolate Cake Gelato. It's a (milk) chocolate base with coconut bits, candied pecans, and a caramel swirl. Talenti has an awesome track record and this one is no exception. Quick rewind: I wrote to Talenti in hopes of tracking down some of their limited edition flavors. They couldn't really help, but they did send over a few free pint coupons. Big thanks to them because I probably wouldn't have tried this one on my own! Oh the pecans! Talenti always goes the extra mile and they've perfectly candied these pecans. They are fresh, plentiful and have this wonderful sugar crunch. There is so much coating that it has partially melted and created a puddle around the pecan. Some are small, some are large, and all are tasty. 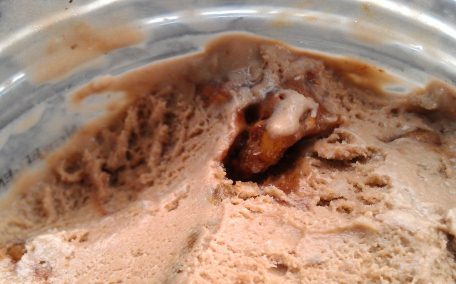 I totally recommend starting off a serving by scooping out a few pecans so that their sweet flavor can really shine through. Once your taste buds are dialed in, then you can dig into the rest of the pint with an open (and happy) mind. Did I really manage to ignore the coconut? Why yes I did. Rather than adding coconut slivers or coconut oil, they've taken coconut shavings, chopped them into tiny bits, and blended them thoroughly throughout the base. This gives us a steady but not overpowering piece of the flavor puzzle. 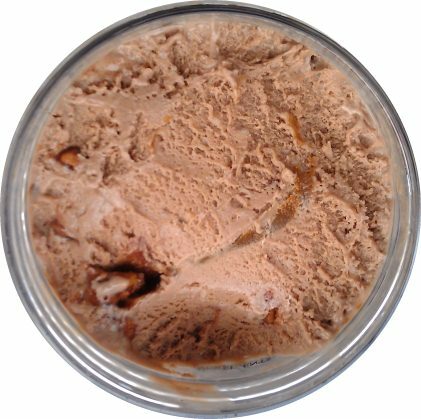 Bring in the very pleasant but not overpowering chocolate, mix in the sweetness of the pecans, and it really is a wonderful flavor profile as well as a very pleasant texture profile. Yes, there is the caramel too, but I was too distracted to really notice it in particular, it was just there quietly playing it's part in this wonderful treat. Could it be better? Honestly? I wouldn't change this one. Oh sure I don't love coconut, but I'd be afraid of ruining the way these pieces come together. Someone took the time to get this one just right. Excellent job as always Talenti. On Second Scoop: Ok, time to try this one when it's not half melted. See yesterday I was sucked in by how the melting gelato was speckled with coconut bits providing a wonderful melting blend of flavors, but how well will it hold up fresh from the freezer? Well, it's still soft actually. This is reminding me of something, but I can't remember what.... yes, I had Edy's caramel coconut cookie but that's not it... oh this stuff is so good. It's just got this neat soft gritty texture. It's funny how the texture can be a hindrance or a help, but here it's a help. Oh I love the pecans, love love love them. This is one of the flavors that you don't really review, you just try to keep the ranting semi-coherent. I just love everything about it, it's perfect just the way it is. Oh wow... I will not hold out any hope that our Kroger will get this flavor but it looks amazing. I had this last week, my pint didn't appear to have caramel swirls (that I could differentiate), but it had a chocolate swirl. Looking at your pictures, though, I'm confused...did yours have a chocolate swirl too? i have a coupon right now. i sure hope i can find this flavor before it expires. yum! @Sam: mine had a thick caramel swirl, fairly dark in color. It didn't stand out on it's own but I definitely didn't see any chocolate swirl. Reminiscent of a Girl Scout Samoa cookie, perhaps? maybe the very mild caramel and the chocolaty base messed with your tastebuds?